Despite our depressingly hot and dry weather this month, great-looking plants are coming along faster than I can write about them. One of my favorites of the moment is the sadly underused annual known as thoroughwax or hare’s ear (Bupleurum rotundifolium). Looking very much like an airy euphorbia, though it’s more closely related to dill, fennel, and other umbellifers, it grows anywhere from 12 to about 30 inches here, with a single main stem that branches heavily toward the tips and beautiful blue-green foliage. Below is a closeup of the blooms and a leaf. Thoroughwax self-sows freely, but (here, at least) never enough to be a pest. The seedlings that come up singly in unexpected places seem to be largest and the most vigorous, but they also tend to fall over due to the top-heavy branching form. They also seem prone to losing their lower leaves, a problem you can see starting in the photo below (a habit shot of the same plant shown closer-up at the top of this post). Seedlings that sprout in groups seem to stay shorter, but they make a very nice clump-like show, and their upper branches weave together to keep the whole bunch from flopping over. 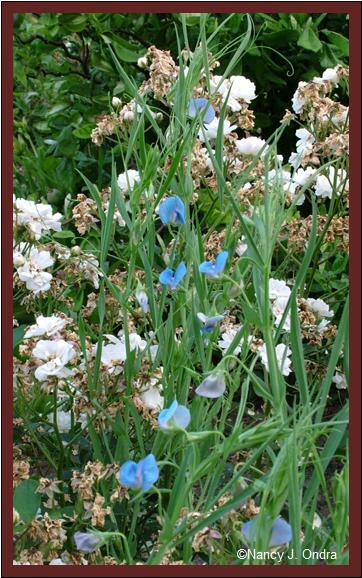 The earliest-rising self-sown seedlings start blooming here in early June, with the later risers starting about now, so I normally have some around well into August. They seem adaptable to either dry or moist soil, and I usually find a few coming up in the morning-sun-only border, but they mostly stay in the full-sun areas. If you think you’d like to try thoroughwax for yourself (and those of you who love chartreuse really need to! 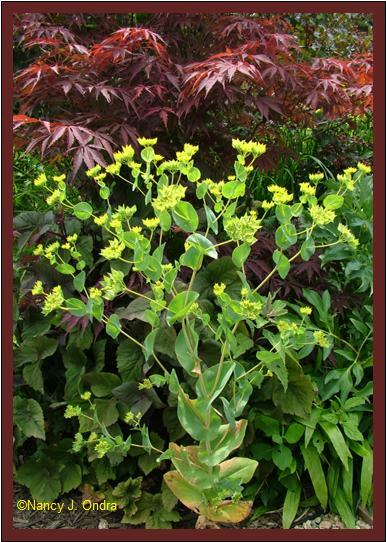 ), you can find the seeds online through Diane’s Flower Seeds as Bupleurum rotundifolium ‘Green Gold’. Chiltern Seed lists both B. rotundifolium and B. griffithii ‘Decor’, which confuses me, since I thought B. rotundifolium and B. griffithii were synonyms. They don’t have a photo of the former, and they list the height there as only 6 to 12 inches, while the ‘Decor’ looks very much like my plants, so you might want to try that latter one if you order from them. Plant World Seeds lists only B. griffithii, but the photo there looks very different from any others I’ve seen, adding to the muddle. Well, it’s worth trying any of them, I think. I also think it’s tough to find a better color than blue to complement chartreuse. 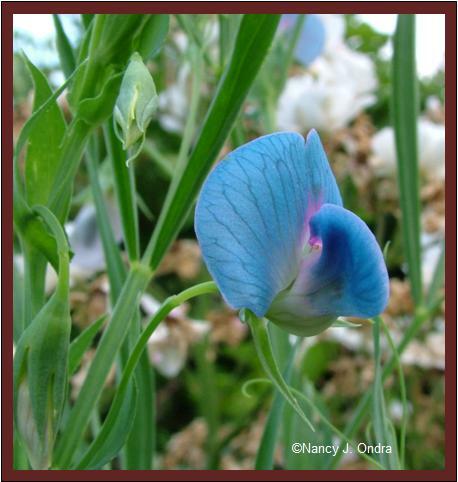 Here’s a blue beauty that’s new to me this year: grass pea or chickling pea (Lathrus sativus). I sowed the seeds indoors in early March and set them outdoors in the third week of April. I wasn’t sure what to expect from the habit, so I planted the seedlings in front of a miniature rose, with the hope that they’d weave themselves up through or else sprawl in front. They got a bit bushier than I expected but are still kind of wispy plants, about 18 inches tall at this point. (Apparently they can get up to about 4 feet tall.) Some of the stems did grab onto the rose, and other stems grabbed onto those, so they’re staying somewhat upright, and they’re moderately well covered with these stunning blue blooms. I’d hoped that they would start blooming in time to shine among the pure white blooms of the ‘Gourmet Popcorn’ rose, but they didn’t begin until the first flush of rose blooms started to turn brown (of course). Still, the plant’s really a beauty. And, unlike the garden peas, which are hating the heat and dryness, the grass pea seems to be much more tolerant of the tough conditions, even growing in full sun. It’ll be interesting to see how long into the summer it continues to flower. Seeds of grass pea are available through a few online sources, including Thompson & Morgan, Chiltern Seeds (as L. sativus var. azureus), and Select Seeds. 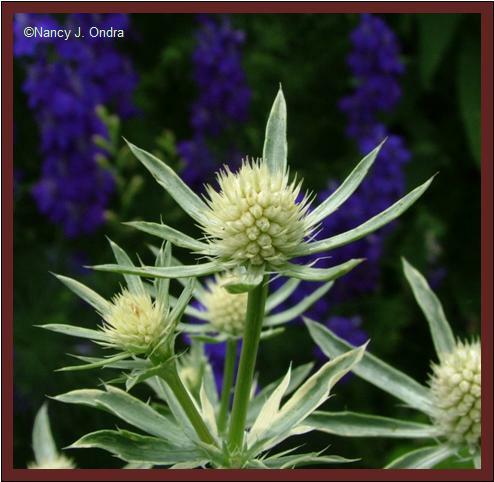 And to finish, another plant that’s new to me this year: ‘Jade Frost’ sea holly (Eryngium planum). I’ve struggled to get sea hollies established in the past, but I lucked out with this one. Not only did it stay alive – it flowered! I would have been happy with just the foliage, though. Here’s a closeup of some of the leaves. Terrific variegation. This one’s growing in a rather dry raised bed, mostly sun but some afternoon shade from the nearby patch of taller larkspur. (The sea holly is about 2 feet tall.) Klehm’s Song Sparrow is one online source, and yes, the foliage also has some great pink in it during cool weather, as shown in the photo on their website. Below is a habit shot of my plant. That’s it for this time. With so much going on in the garden, I expect I’ll be doing many more of these “Three Neat Plants” over the next few months! What beautiful plants, all of them. 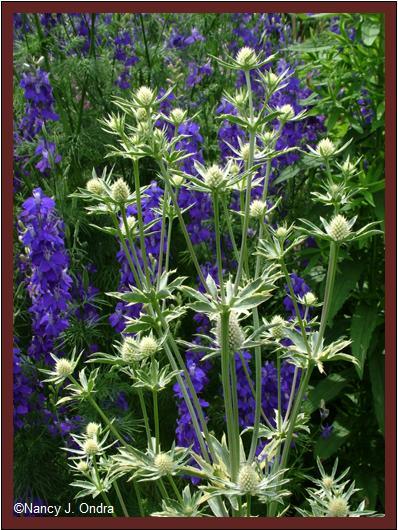 Sea holly is one plant I put on my Wish List at the start of this season. Love it! I hope you can find sea holly and have luck with it yourself, Nancy. I’m so thrilled to finally have it. My next challenge will be to see if I can have it come back next year. Ooooo this post makes me want to start haunting the local nurseries. Great picks Nan. Wow, if I can make anyone want to go plant shopping at this time of year, I must have done something right. What are you waiting for, Lisa? Go shopping and report back! Um, yeah, that could definitely explain why it’s not more popular. I find myself calling it Turtlewax, which at least is a somewhat more familiar (though no more appropriate) name than thoroughwax. Hare’s ear isn’t horrible, but it really doesn’t make sense either. And bupleurum hardly rolls trippingly off the tongue. Maybe we should put our minds to coming up with a much more gardener-friendly name. Anyone have any ideas? You always have some new treats for us. That sweet pea is definitely a keeper with the color reminding me of Tweedia/Oxypetalum. 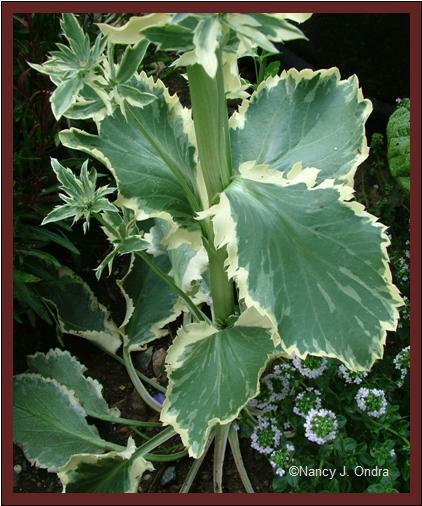 I’m also loving the variegated sea holly. Oh, wow, Layanee – thanks ever so much for reminding me about the Tweedia! I definitely need to grow that at work next year; the owner is fanatical about blue, and he’d love that one. Nan – I never knew a varigated Sea Holly existed! That is so cool looking! Another to add to my wish list. Thanks for sharing. Hi Gina! I didn’t know it existed either until three months ago. It *is* awesome and defintely worth trying. I hope you can find it! The sea holly foliage is gorgeous! I’m so glad it is doing well for you. Thanks, Robin! Finally succeeding with a troublesome plant is always a reason to celebrate. I like your Sea holly plant, wery nice foliage. Hi Ken! Knowing how you appreciate great foliage, I’m not surprised that the sea holly appeals to you too. Hi Nan, those are three neat plants. The pea is a must have, that color is sublime. I am having better luck with the eryngiums seeding about now, don’t know why, but that Jade Frost would be a nice addition to the mix. Wonder if we could get a cross from them? I’m really liking that grass pea too, Frances. Hey, maybe I’ll get some seed from it to share! I daren’t even hope for the eryngiums to seed for me; I’ll just be happy if the plants I have overwinter. The type of variegation ‘Jade Frost’ has doesn’t reproduce from seed (in my experience, at least), so I suspect its seedlings would be ordinary E. planum. But really, even ordinary ones are ok by me! Wow! I am a first time visitor to your blog. I LOVE your Sea Hollies. Beautiful! Welcome, Laurie! Thanks for visiting, and for your comment. Thanks, Kim! Obviously, I too find habit shots very useful – almost as good as actually seeing the plant in person. I love dramatic closeups as well, but from a design standpoint, it’s frustrating to fall in love with a beautiful bloom or leaf and then find out that the plant itself is ugly or sprawly. Now I’m really kicking myself! I had that ‘Jade Frost’ in my hand & I put it back. This was at that nursery I made the special trip out to. Arrgh. BTW – I just discovered that I’m not getting updates for your blog on Google Reader. Hopefully you’ll be able to grab a ‘Jade Frost’ next year. I think you’ll love it. I’m not sure what’s up with the Google Reader thing. I didn’t intentionally make any changes that would influence that. I’ve been meaning to try it for myself, so maybe I’ll find out what’s up in the process. So thats what it is – love that Hare’s Ear. 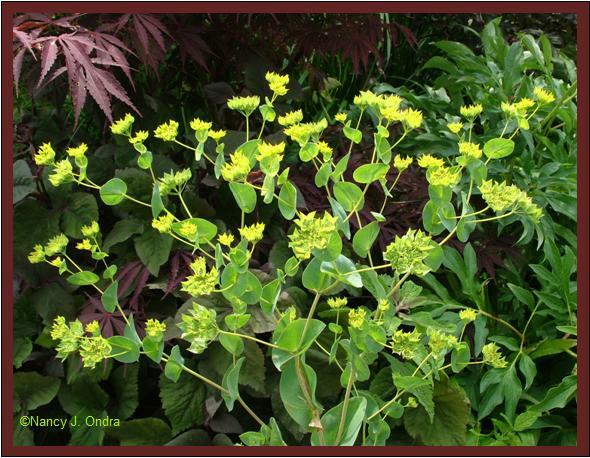 I saw it at Wave Hill (it was well propped up)and thought it was an Euphorbia. Must try it out next year now that I know what it is. Hey, I’m glad I could help. I could collect some seed if you’re interested. Wing Nut was telling me that the sea holly just keeps flying off the shelves at the nursery. And they just got the variegated one in last week. One of our neighbors has it planted right along the sidewalk–ouch! Hey, Curmudgeon. I can easily imagine that it would be tough to keep ‘Jade Frost’ in stock; it looks super in a pot. Mine looks really pathetic now, so I cut off the one flowering stalk, hoping to get it to leaf out again and save some energy for winter. i just discovered your site via the nytimes and was so excited to see your pictures of the blupleurum! i’ve been using this quite a bit of late in flower arranging classes (as it’s so easy to come by this time of the year) – it’s so nice to see photos of it in its planted form. such a great summer foliage. Hi, I too saw the article in the times! I have a foliage garden that’s all grey and red plants-lots of drama! My favorites are a red leaf sage and all the carnation family. I’m also experimenting with cardoons and other plants a bit “out of my zone” (5). Any tips? Greeting, my fellow foliage fanatic! So sorry for the delay in responding to your note. I guess you could try mulching very heavily to see if you could get the cardoon through the winter. Or, just start new plants from seed each year. If you sow indoors in late January, you should be able to get decent foliage clumps by mid- to late summer. Hi there. My daughter is called Jade Frost and just wondered how and where I could buy this Jade Frost sea holly. It is her birthday soon so would it be suitable to put in a pot and be kept as a house plant. As you can probably tell Im am not particularly green fingered myself. Your advise would be very much appreciated. I’ll be in touch with you by e-mail, Jayne! 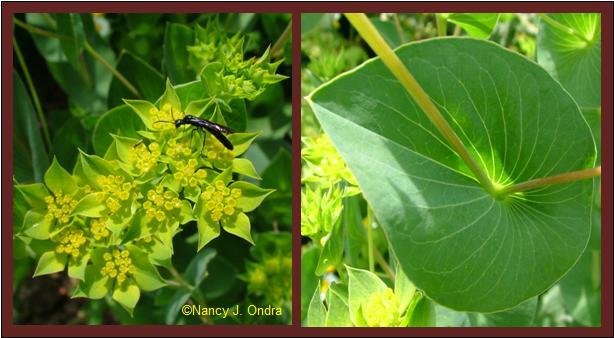 I am interested to know if a sort of plant that i have found in Sardinia is Bupleurum rotundifolium. How can I show you the fhoto of this plant in this site? I’ll be in touch by e-mail, Maria.